Top: Juan Popoca / Bottom: Ángeles Torrejón. EZLN guerrillas circa 1994. The Zapatistas argued at the 20th anniversary National Indigenous Congress that resource exploitation will ultimately destroy the people. As the iconic Subcomandante Marcos – also known as Subcomandante Galeano – made a rare appearance, the Zapatistas renewed their call Tuesday for Indigenous unity across Mexico in the face of what the movement criticizes as runaway social and environmental destruction for the benefit of a few, while the people – especially Indigenous communities – suffer the consequences. 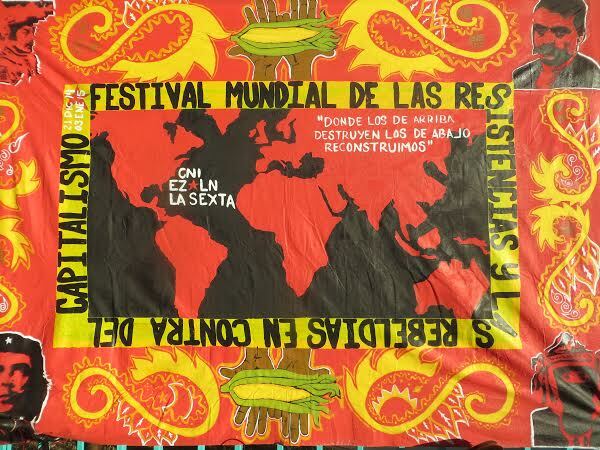 From December 21, 2014 through January 3, 2015 some 2,600 people from 48 countries (2,050 from Mexico and 550 from other countries) gathered for the first Worldwide Festival of Resistances Against Capitalism. 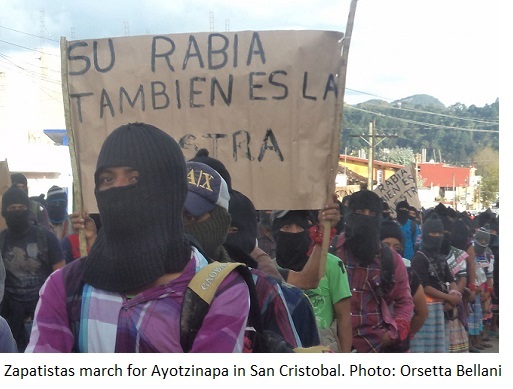 Zapatistas rally in San Cristobal, Chiapas, for the students disappeared in Ayotzinapa, October 2014.